In her late 20s, Lauren Collins moved to London, and fell in love with, and married, Olivier, a handsome French mathematician. When he has to relocate to Geneva for his work, she decides to go with him. In Geneva, however, Lauren is lost for words, literally: not only can she not communicate to the local chimney-sweep when he visits, but, watching Olivier converse fluently in French every day, she is also made painfully aware that she has never really spoken to her husband in his own language. She can say, 'au revoir' and 'bonjour' but that's about it. 'Hello and goodbye were a pair of bookends,' she writes, 'propping up a vast library of blank volumes, void almanacs, novels full of sentiment I couldn't apprehend.' What will happen when she has children? she wonders. If they grow up speaking French, will they be stuck with a 'Borat of a mother' who can't properly understand them? So she embarks on a quest to learn French, and, in doing so, must tangle with the intricacies of French culture--which, it turns out, is a far cry from family life back home in North Carolina. Down the rabbit hole of French Collins hurtles; role-playing with her classmates at language school; coming to terms with antique French social customs; accidently writing explicit "thank you" notes to her French in-laws; and delving into the strange and wonderful history of humanity's many forms of language. 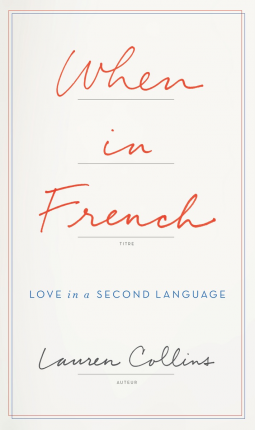 When in French is a moving, laugh-out-loud funny memoir about falling in love, learning another language, and living far from home, as well as a freewheeling history of language. Collins investigates, among other things, how children acquire speech, the history of the idea of 'American' as its own language, and why we don't trust people who adopt accents. (Her own father takes on a southern accent after moving to North Carolina, much to her mother's chagrin.) Plumbing the depths of the mysteries of foreign languages, Collins confesses--with style, sparkling humor, and touching honesty--to the frustrations, pleasures, surprises, and, finally, satisfactions of learning French.